What kind of pen and ink for underdrawing of oil painting. For the ink drawing, can I use a sharpie? Can you use a fine point sharpie instead of the magic ink? Please , don't laugh I'll get this ink all over me, I just know it! Sharpie brand ink pens have a type of ink that will repel the oil paint layer and bleed through the painting. There are several manufacturers that make a felt tip, fine point pens with "water proof India ink." They will be found in your local art supply store in the drawing section. At least, that's where I found mine! 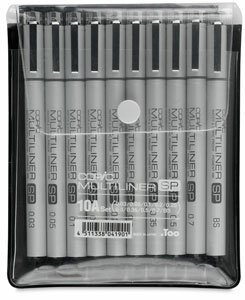 Stick with these if the calligraphy pen is gonna make a mess for you. 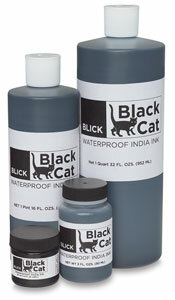 PS, most art stores have the water proof india ink in pre-loaded cartridges for calligraphy. try those instead of an ink well. Comments for For the ink drawing, can I use a sharpie? Here's the scoop on the pen needed for underdrawing your oil painting. Here's something very close to what I use. I do have a calligraphy pen with various sized nibs. But these felt tip pens work just as well. The ink must state that it is waterproof. The one that I have is similar, but a different brand and actually states on the pen that it is filled with waterproof India Ink. Brown or black will work fine also. Click on the images to get more information on these products. What kind of pen for under drawing? What kind of pen should I use for the under drawing and what color ink? I've heard different opinions on this. Some people say brown ink instead of black; some people say they use a technical marker/pen instead of the pen nib and dipping ink. Just curious what you use/recommend. Thanks! Hey John! thanks for a great question. I've got to slip out to the studio to get the info, I'll be back with an answer. Can't remember the brand of ink I used on the last few paintings. I've also got a nifty pen that has indian ink in it already that works great too! Here's something very close to what I use. I do have a calligraphy pen with various sized nibs. But these felt tip pens work just as well. The ink must state that it is waterproof. The one that I have is similar, but a different brand and actually states on the pen that it is filled with waterproof India Ink. Brown or black will work fine also. Click on the images to get more information on these products. It takes you to a new page on a site that I use regularly for my supplies. Great folks to work with! Comments for What kind of pen for under drawing?